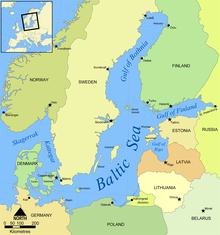 The Baltic Sea is a sea in northern Europe between Scandinavia, Finland, Russia, the Baltic countries, Poland, and Germany. Many big rivers in the surrounding countries drain into the Baltic Sea. The Baltic Sea is connected to the ocean through the narrow and shallow Danish straits and belts. For this reason, the water has a low amount of salt, so the northern parts of the sea freeze over in the winter. The ice can carry cars, and roads are established every winter between the islands in the archipelagos between Sweden and Finland. For several thousand years, the Baltic Sea has connected the countries at her shores. For that reason there are many cultural similarities in these countries. Since all of these countries are European, this sea is also considered European. This page was last changed on 20 January 2017, at 12:01.